I love when someone I follow posts an amazing Two Ears photo. This inspiring picture came from Chris Cox, a trainer that I have been following for a few years. He’s won the Road to the Horse series several times and stars in Chris Cox Horsemanship that airs on RFDTV. I personally like the “Problem Horse Series,” where he visits ranches across the country to work with horses and their owners. After working with rescue horses for the last decade, problem horses are right up my alley. Cox’s training style is in line with many others that I have learned from, like Ray Hunt, Julie Goodnight, and Stacy Westfall. Some call it natural horsemanship, I call it practical training. In a world where training schedules are over booked I appreciate that Chris took time out of his day to slow down and savor nature’s splendor. 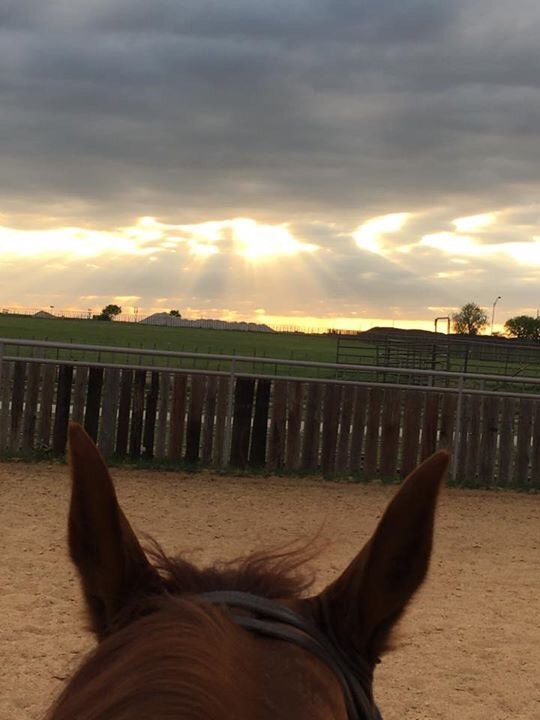 This picture not only captures a beautiful Texas sunset but also a moment between a man, his horse, and God. He shared this personal peace with his Facebook fans, giving them a glimpse of the man behind the brand; something that many professionals rarely get to do amongst all the sponsor advertisment. This rare connection between fan and horseman has ignited a deeper respect and enthusiasm for Chris Cox Horsemanship. I plan on a training video binge this weekend.